Deputy Minister Litzman calls to bury the ‘bodies’ exhibit. Rabbis: ‘Horrible’ exhibit dishonors the dead. Deputy Health Minister Yaakov Litzman has declared that the “Bodies” exhibit is breaking the law, and is calling on the government to bury it – literally. The controversial exhibit shows the inner workings of the human body using actual human bodies. The origin of the bodies has not been made public, and it is widely suspected that they are bodies of Chinese prisoners who were executed, and whose families did not approve the use of their loved one's corpses. Litzman sent a letter to Attorney General Yehudah Weinstein noting that the exhibit appears to violate Israeli law, which does not allow burial to be postponed for more than 48 hours after death without authorization from a doctor employed by the state. “I would appreciate it if you would inform the organizers of the exhibit that they must bury the bodies immediately,” he wrote. 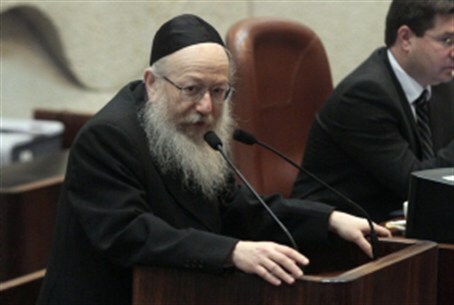 Litzman’s letter follows an appeal from religious-Zionist rabbis. Rabbis Dov Lior, Uri Sherki and Elyakim Levanon wrote to Litzman and to Prime Minister Binyamin Netanyahu, who officially holds the Health Ministry portfolio, and protested the decision to allow the exhibit to go on display in Tel Aviv. “Since the display has entered the country, we cannot escape the moral obligation to honor the image of God in which the dead were created, and to bring them to burial as soon as possible,” they continued. Both Jewish law (halacha) and Israeli secular law require that the dead be promptly buried, they noted.